One of the most recognizable mountains in the Canadian Rockies is Mount Lougheed. Located approximately 15 kilometres southeast of Canmore, this majestic 3,150 metre (10,335 ft.) mountain is named for Sir James Alexander Lougheed. However, Lougheed is not the only name the mountain has had. In fact, it is not even the first mountain in the area to bear the name Lougheed. The story of how the mountain became known as Mount Lougheed is interesting. Mount Lougheed from the Trans-Canada Highway, August 2011. The entire massif is known as Mount Lougheed. The large, central peak is likely the feature named “Windy Mountain” by Eugene Bourgeau in 1858. The prominent peak furthest to the right is Windtower Mountain. The peak known today as Wind Mountain is the distinctly pointed peak visible on the horizon at left side of the photograph. Source: Larry Pearson, Historic Places Stewardship Section, Alberta Culture and Tourism. Located between the Astoria and the Whirlpool rivers is a mountain considered by many to be the most majestic in Jasper National Park, if not the entire Canadian Rocky Mountains. At an impressive altitude of about 3,300 metres, the mountain has been known by a number of names. French Canadian voyageurs using the Athabasca Pass referred to the notable landmark as La Montagne de la Grand Traverse (Mountain of the Great Pass). Dr. James Hector of the Palliser Expedition referred to it as Le Duc, probably after a Metis member of his party. 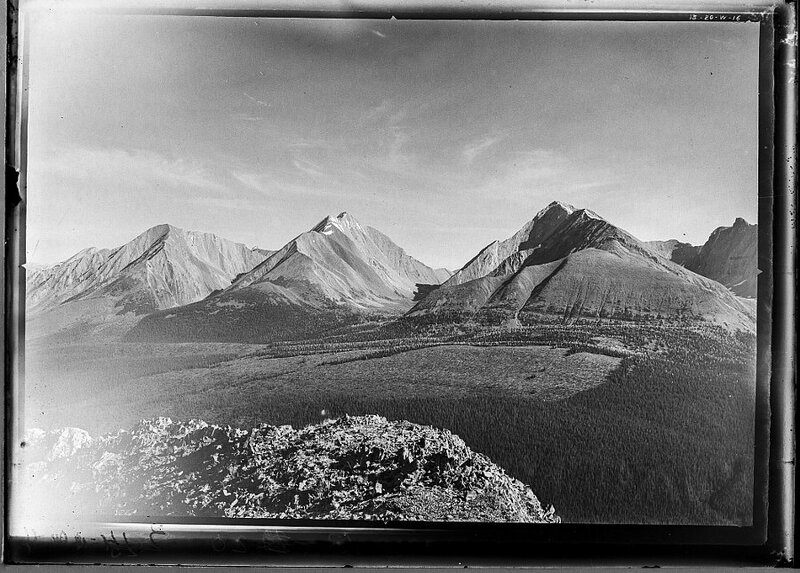 In 1912, Arthur O. Wheeler of the Alpine Club of Canada and the Interprovincial Boundary Survey named it Fitzhugh Mountain, after the townsite of Fitzhugh, which was named for E. L. Fitzhugh, a director of the Grand Trunk Pacific Railway (the townsite of Fitzhugh was later renamed Jasper). It had also been periodically, and incorrectly, referred to as Mount Geikie. Today, and since 1916, the mountain is named Mount Edith Cavell, named for a British nurse who never set foot in Canada, let alone within Jasper National Park or on the mountain itself. How this mountain became a commemoration to Edith Cavell is an interesting lesson in Canada’s role in the First World War, its place in the Empire and the importance of wartime symbolism and the values of myth and memorialization. North face of Mount Edith Cavell with Lake Cavell in the foreground, ca. 1945. Alberta’s history is rife with many stories of interesting and fascinating cowboys and ranchers. High in this company stands John Ware, a black cowboy and rancher of near-mythic standing in Alberta’s history. John Ware has become almost an unofficial emblem of Alberta and western Canada, featuring prominently in centennial exhibits, in books and even on a Canada Post stamp. He is often portrayed as an embodiment of western Canadian values and as a demonstration of the levelling effect of the pioneer period and the cultural tolerance that was only possible on the Canadian prairies. There is little doubt that John Ware truly did enjoy the respect of his fellow ranchers and cowboys and his story, even if exaggerated, is an inspiring one. Yet, despite this outpouring of goodwill, respect and admiration, for many years John Ware was commemorated by a racially derogatory name prominently displayed on maps. John Ware with his wife Mildred and two of their children, Robert and Nettie, ca. 1896. In a previous post, we looked at the naming of five mountains in Jasper National Park after First World War Victoria Cross recipients. It took a number of years and some persistence from the Geographic Board of Alberta to achieve this natural war monument for the service of five soldiers to the British Commonwealth in the First World War. 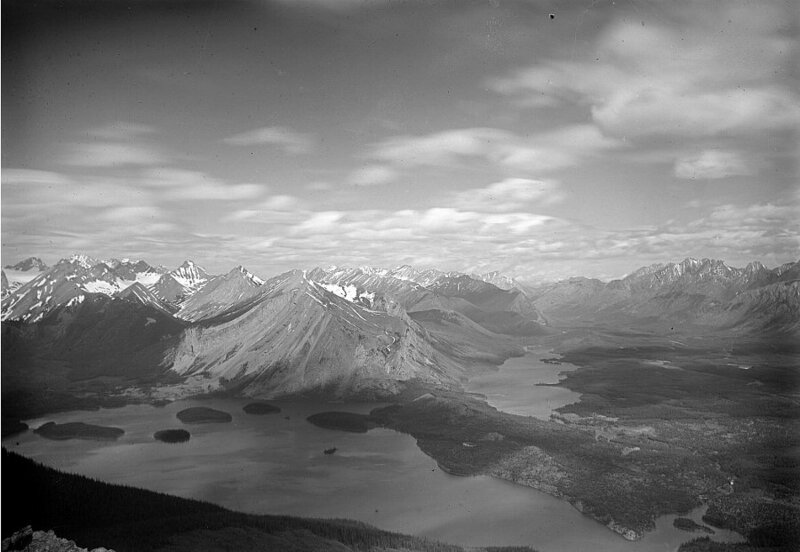 In addition to naming the mountains, the negotiations between provincial and federal naming authorities resulted in the naming of the Victoria Cross Ranges in Jasper National Park to serve as a long-standing tribute to all recipients of the Victoria Cross. This naming decision created a naming policy that is still honoured today.